The Viceroy Santa Monica offers couples a beautiful array of backdrop options for their engagement session photos. With a mid-century-modern vibe and enough boutique-style touches to make your head spin, this location offers photographers a wonderful array of options for couples who love to glam it up. You won't find this blue curtain at the Viceroy because I created this look in Photoshop to pick up the tones in the groom's suit. Like many privately owned properties in the Los Angeles area, this hotel does charge a fee to let photographers shoot on its property. The current charge is $600, and you must pre-arrange your shoot day/time through the Viceroy. 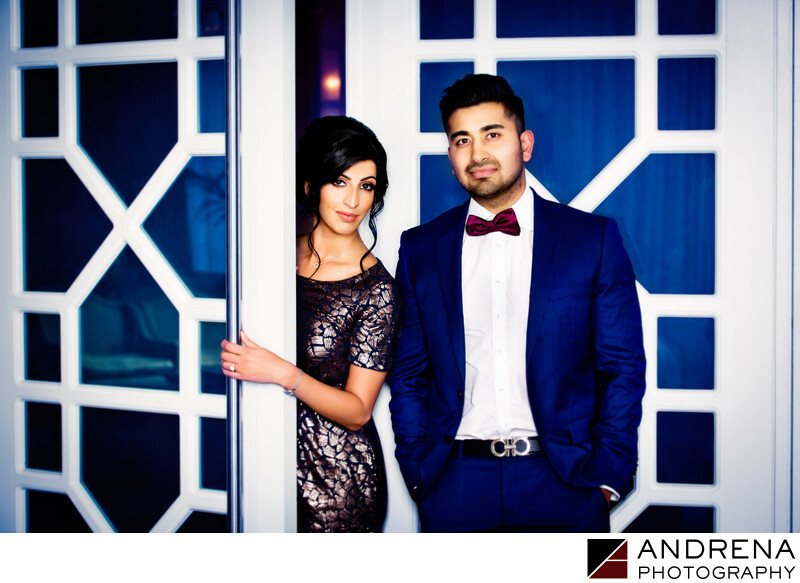 I love having this hotel as an unique and stylish option for my pre-wedding and engagement shoot couples. Location: 1819 Ocean Avenue, Santa Monica, CA.